Bought this lens last month and I must say that it really surprises me! I bought this lens for my EOS 20D. Before this lens, I was using EOS 28-135mm lens. After the upgrade, I found that 28-300mm lens give me almost distortion free image even at 300mm range. When I used 28-135mm lens, the distortion on the image is very visible when I am at 135mm range. Even at the wide angle range, I noticed that 28-300mm lens gives me much sharper image while 28-135mm lens gives me much softer image. The focus is very fast for 28-300mm L lens. On the down side, this 28-300mm lens is really heavy. Holding it will really wear you out. The auto/manual focus switch is arranged in a very awkard position. It is very easy to change your auto foucs setting to manual setting. The lens also will be pulled all the way down due to its weight when you carry it around. I have to carry it with my hand and not make it extend itself all the way down. If picture quality is what you are after, go for this lens. I am very pleased with the sharpness and the fast focusing. I agree with Ben's comment. I have had this lens for three weeks now. It's a bit heavy. But I got used to it's weight quickly. The sharp detail and untra fast focus is very impressive, especially at the macro depths,, I am so shocked at the macro capabilities. I originally wanted the 100-400 L IS, but when you crop a picture with an L lens.. It's all the same! I love this lens,, the best investment I ever made. 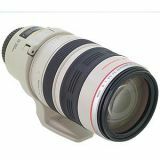 Probably the best 28-300 zoom out there, but keep in mind, it is a 28-300 zoom, and comes with many problems inherent in this species of lens, albeit at a lesser degree than its counterparts, including slight vingetting and distortion. Pricey, but if I had to choose only one lens, this would be it.